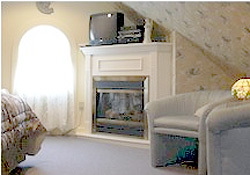 Angels' Watch Inn, Westbrook CT. is the perfect romantic weekend getaway. Offering Elopement and intimate wedding packages . Stressed come to our massage therapy, and wellness therapies sessions. Let your next event be a Murder Mystery Dinner. 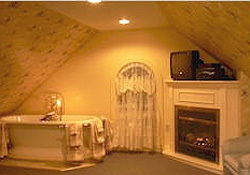 Angels' Watch Inn rooms have pedestal soaking tubs, fireplaces, canopied and sleigh beds. Call about our mid week and off season specials. 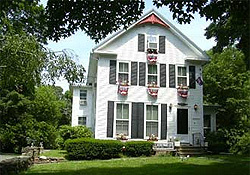 Angels' Watch Inn Bed and Breakfast is only one and one half blocks from Long Island Sound and many quaint New England towns such as Old Saybrook, Old Lyme, Essex, Chester, Deep River, Haddam, East Haddam, Clinton, Madison, and Guilford within minutes of Tanger Factory Outlets and Clinton Premium Crossing outlet shopping, fine dining, marina district, antiques, Chamard Vineyards, Essex Valley Railroad, Gillette Castle, Goodspeed Opera House, and just 30 minutes from Mystic, and Stonington wineries Foxwoods and Mohegan Sun casinos, Mystic Seaport, Mystic Aquarium, Yale University, Wesleyan University, Connecticut College, And the United States Coast Guard Academy. 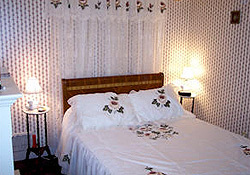 Five newly renovated guest rooms are beautifully furnished and decorated for your pleasure and comfort. We look forward to your visit. Call and reserve today.